New to the Kennelgate range is the introduction of the Ezy Dog range. The Ezy Dog Zero Shock dog lead, offers the next generation of shock absorbing dog leads. The Ezy Dog Zero Shock dog lead, is a high-spec design, shock-absorbing webbing dog lead that works. Meticulously designed, the Zero Shock Lead has a highly sprung bungee system that effectively absorbs any sudden shocks made by your dog. Furthermore, it is soft, durable and will not wear over time. The Zero Shock Lead combines ultimate comfort, control and protection, without compromising on style and quality. Made from super soft, double density nylon makes this 180mm lead a pleasure to hold and outrageously strong. We finish it off with reflective trim for night time safety and an additional neoprene lining in the handle. 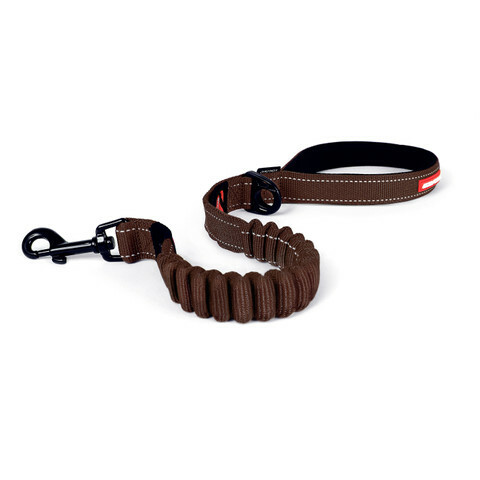 The Zero Shock lead is perfect for walking, jogging, running and cycling with your dog. The 48 Inch lead also comes complete with a traffic control handle, this extra handle is positioned near your dog’s collar giving you quick and secure control of your dog when required.